We evolve, We Grow, and so does our family of products and services. 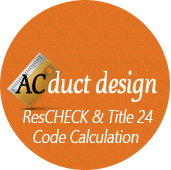 Our HVAC Calculation Services department is now offering ResCHECK Calculation Services and Title 24 Calculation services for our customers out in California. Once again we stand by our team of experienced professionals, and look forward to offer our customers a fast, simple and reliable service. Our fees are simple and affordable for homeowners, Businesses, Architects, Engineers, Builders & Contractors. If you would like to know more about this, please visit www.ACDuctDesign.com or give us a call 800-810-3280! We are here to make your life and your job easier.